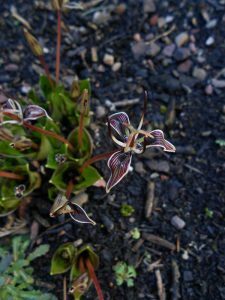 Scoliopus bigelovii is referred to as having quaint flowers by the Alpine Garden Society in their Encyclopaedia of Alpines. The RHS dictionary of Gardening is more specific, mentioning a malodorous smell. Quite unpleasant when you take the time to reach down and let your senses appreciate the odour. As did Jane, one of our Garden Guides who brought it to my attention tucked away in the alpine peat steps. Forming a tight clump of fresh green shoots sprouting up in open cylinders with the flower spike above. These unusual flowers comprise linear marked sepals surrounding again three thin much reduced petals all surrounding the flower parts. A native to NW America, in cultivation preferring a moist, shady situation sheltered from excessive cold. How pleasant to see an old friend on this wonderful website and I’m pleased this wonderful little plant has found a home over the pond! On the coast of California, in the redwoods, this was one of the earliest bloomers in the understory. A local name there is “slinkpod”, as the fruit is pushed out along the ground by the pedicel. The perhaps more common name is “foetid adder’s tongue” as the flowers smell like rotting animal tissue and are, obviously, largely pollinated by flies. The spotted foliage on some populations is thought to resemble rotting meat by some naturalists.